Innovation in physical therapy EMR technology has changed physical therapy practice for the better with improved patient care and greater financial success. The easy integration of physical therapy EMR software with medical office systems has helped improve system development and the progressive extent of the practice. How Physical Therapy EMR software can benefit your clinic? Personalized patient care: The primary aim of any medical clinic is to provide effective and customized service to its patients. With Physical Therapy EMR software, the practitioner has complete access to each patient’s health records and can give a quick evaluation for treatment, thus improving healthcare management. Additionally, it is easier to coordinate with other medical support within the system. Evaluation of the clinic: Physical therapists have the extensive responsibilities of managing the clinic along with taking care of its patients. The convenient records of EMR software provides easy evaluation of the strengths and weaknesses of the clinic. Documentation: Information and data about all the patients is valuable for tracking injuries, health issues, and devising medical treatment. With EMR software, physical therapists can streamline all the available information in a single file, so they can easily access it again in a matter of seconds. This not only helps to simplify the practice, but also improves patient care and its timely effectiveness. 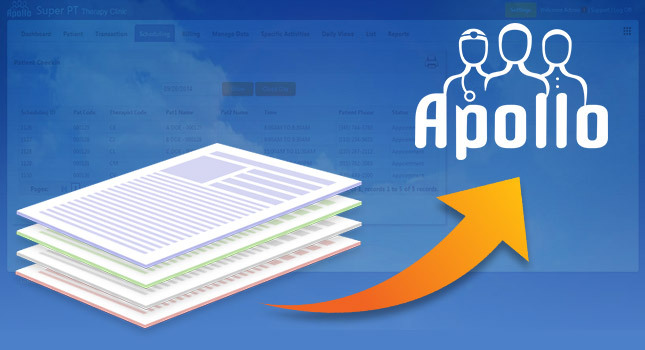 Effortless paper management: Physical therapy EMR software allows you to upload all patient information (including scanned documents, care plans, or patient handouts) in a secure cloud network, eliminating any need of storing endless paper documents. It also has the added convenience of letting you download patient records anytime, anywhere, and from any device. Fast compliance: Accurate compliance is the most complicated procedure of managing a physical therapist practice. With EMR software, the process of submitting claims not only becomes faster but also more efficient. The claim submission application becomes error-free and quick with fewer rejections. The software helps to overcome penalties and enhance collection incentives by making sure that your clinic follows every rule and regulation. Customization: With personalized features, you can include various templates to design your bespoke system architecture to meet your clinic’s unique needs. Whether you choose a simple template or a complex one, the software helps you to be in complete control of your practice.